Then I got this scar sneaking under the door of a pay toilet. Maybe we mentioned that we were working on the closet in our bedroom. When we were ready to fit the bifold doors, we had to find a way to overcome the obvious problem. No doubt you remember, the floor slopes down alarmingly away from the exterior wall (right to left). 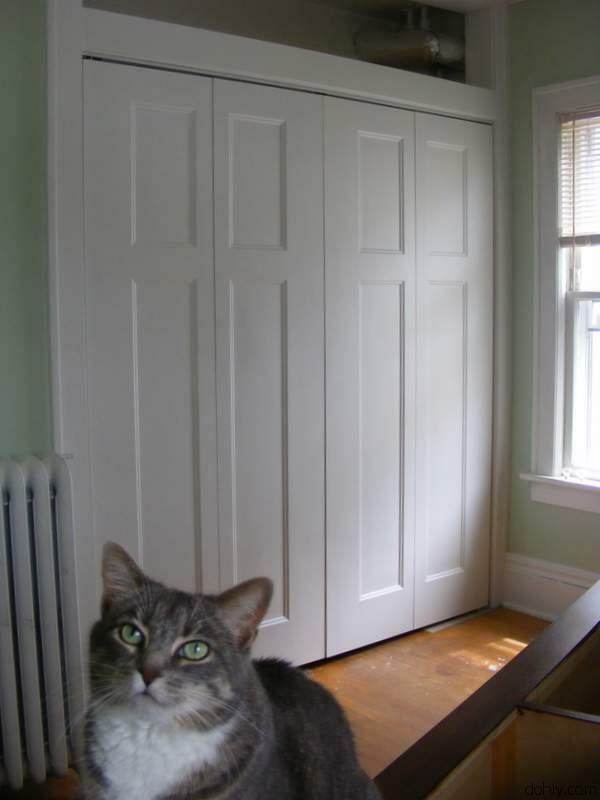 We quickly decided that the doors should be installed level, and that we would deal with an uneven gap at the bottom of the door. 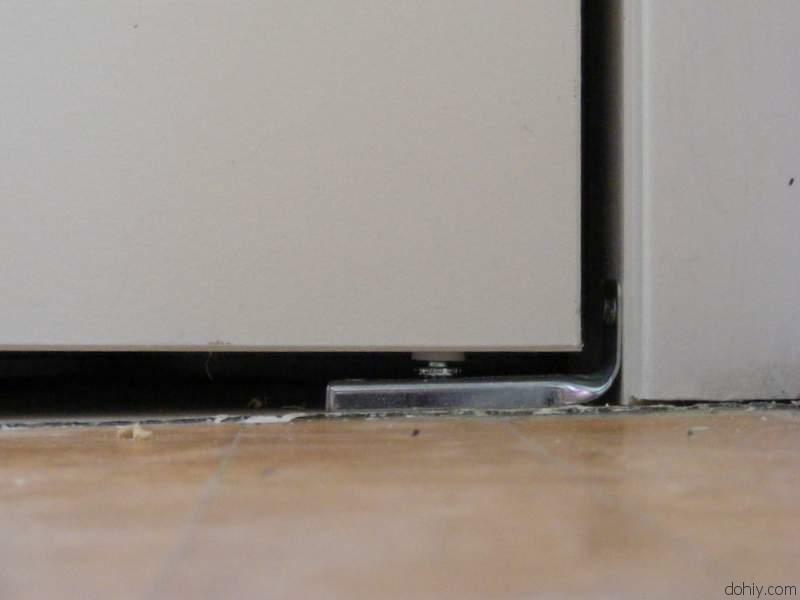 The gap under the left side of the door is 1½ inches bigger than the gap under the right side. For the most part, the door fittings were installed according to the manufacturer’s instructions. The upper slides were fitted exactly as detailed in the instructions. The top closet door rail was installed as per instructions. Also, the lower right hinge bracket installation matched the manufacturer’s vision. The bottom right hinge bracket installed as nature intended. The only deviation from the standard installation was with the lower left hinge bracket. We had to raise the lower left hinge bracket up 1½ inch, so that it would engage with the bottom of the door. Our solution was to put it on a block of wood. We wanted the wood block to be as unobtrusive as possible. Since the floor is maple, we would use a block of maple. There was a problem, in that, none of the local home improvement outlets had 1½” thick maple. Probably we could have gotten fixed up at a lumber yard. But since we only wanted a piece four inches long, I decided to improvise. I bought ¾” maple, cut two pieces slightly longer than the hinge bracket, and screwed them together. The outward facing side was sanded to hide the joint. The block was screwed to the floor, with the screws positioned such that they would be hidden under the hinge bracket. 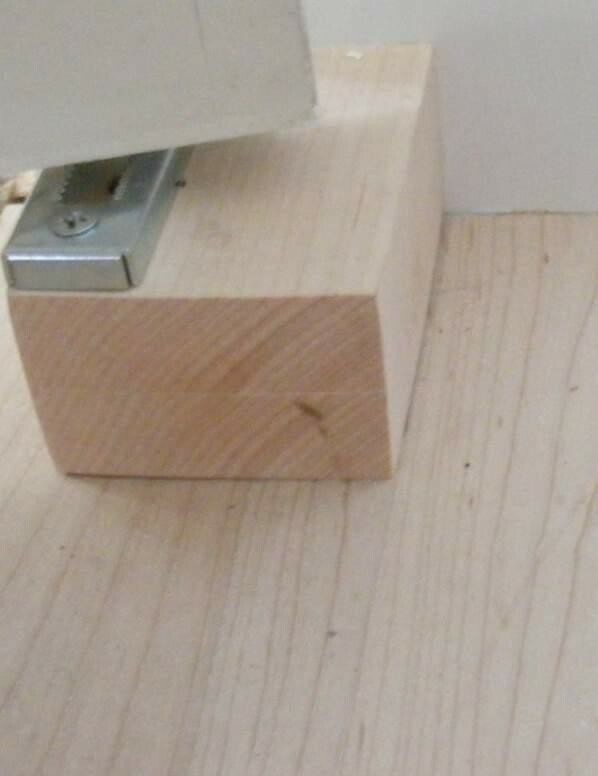 This is the block of maple under the hinge bracket. If you look through the gap in the hinge bracket, you can see one of the screws that holds the block down. Finally, the hinge bracket was fitted on top of the block, and the door installed as normal. I sanded this side of the block so that the joint wasn’t obvious. So there it is. Hopefully the gap won’t be too noticeable once the room is functional. 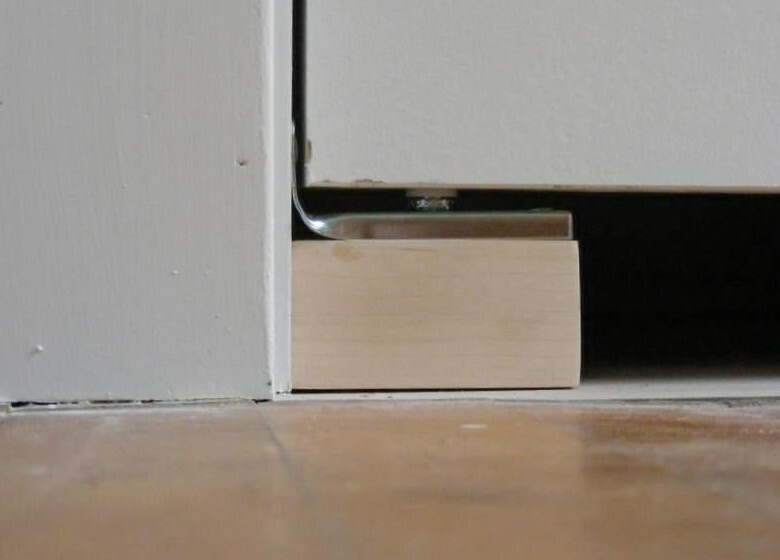 I imagine that with a bed in the way, it will be difficult to view the bottom of the doors from across the room; and when that block is finished to match the floor, it will become almost imperceptible. Yes, I know—dream on. Anyway, as long as Mayya sits right here you can’t even see the gap. 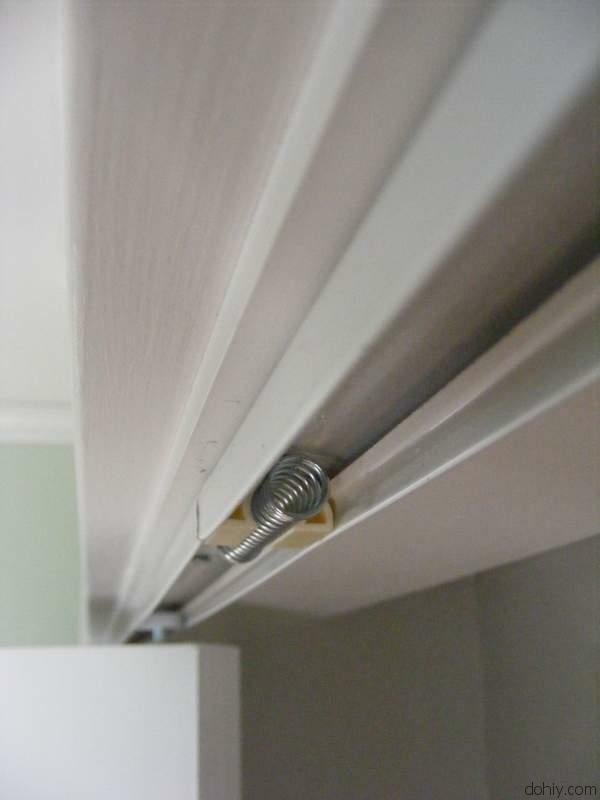 This entry was posted in Construction, D'oh!, Walls & Floors, Windows & Doors and tagged bifold closet door, bifold door, bifold door over uneven floor, installing bifold door. Bookmark the permalink.